In Greek mythology, Calypso was either a goddess or an ocean nymph, who inhabited a mythical island called Ogygia. Calypso appeared in the Odyssey, the Greek epic that describes the wanderings of Odysseus* on his way home from the Trojan War*. Although accounts vary, Calypso was apparently the daughter of a Titan, possibly of Atlas. 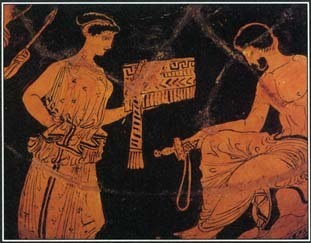 This Greek vase painting from the 400s B . C . illustrates an episode from the story of the Greek hero Odysseus. Returning home from the Trojan War, Odysseus was shipwrecked on an island where the nymph Calypso lived. yearned to return home to see his wife, from whom he had been separated for a long time. Zeus* took pity on the hero and sent Hermes* with an order for Calypso to release him. She agreed and gave Odysseus supplies for his voyage. Legend says that she bore him at least one son. See also Odysseus ; Odyssey, the ; Titans . what realy happened to calypso after the disparture of odysseus. Which Black actress portrayed Calypso in a biblical movie? was it Lena Horne or Leslie Uggams or Dianne Carrol which Calypso held Odysseus for 7yrs before releasing him by order of the geat god Zeus. I saw a movie once where there was a black actress portrayed Calypso,is there a photo of this and the actress name that did this part?.